Best Queen Air Mattress Review: 5 Top-Rated in April 2019! An air mattress is an inflatable mattress that comes in a number of configurations. These configurations start from the basic vinyl inflatable mattresses to the more complex bubble compartmentalized mattresses. When you decide to choose such a mattress for camping, you need to consider a number of elements that are not usually considered for home use. First of all, I am introducing queen sized air mattresses, so size is not an issue here, all queen-sized mattresses must be 60” X 80”, 152.5cm X 203.5cm, the depth of the mattress can differ, but the length and width are set. The considerations you need to look at are deflated storage size, quality of the material for outdoor use and the overall thickness of the mattress. Camping Air Mattress – Which is Better? This is an insert for a queen size mattress that provides an internal air chamber to a queen sized spring mattress. If you own a sleeper sofa that uses Leggett and Platt Air Dream Parts, then this is the replacement air balder you need to insert. This bladder fits into the 10-inch Sleep Sofa mattress and combines with the springs in a unique patented design. This is a replacement bladder for the Air Dream Mattress internal air bladder unit. 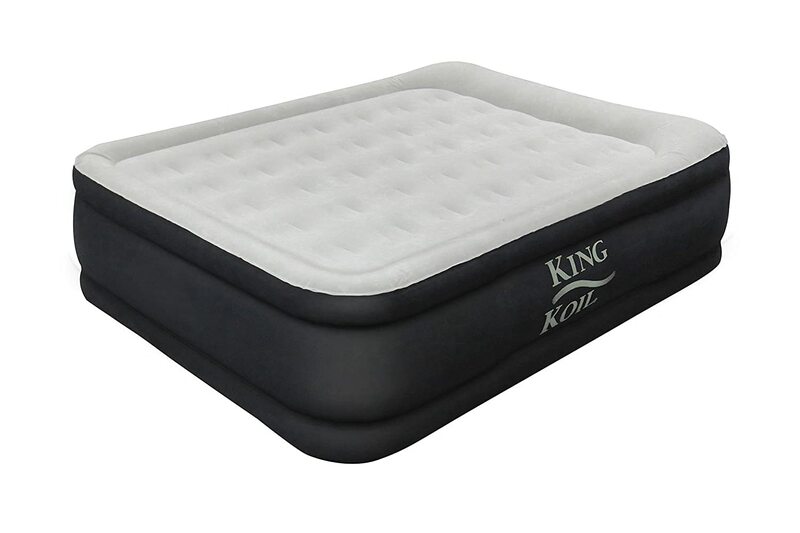 King Coil enhanced airbed technology is put to good use in this mattress. This one is a queen sized mattress with a 20” thickness and comes with a suede top for a smooth touch and feel. There is a twin sized Coil-Beam Construction and a BUILT-IN 120V AC Pump that supports a load of up to 300lbs. This model is very easy to use, you just plug it in, and it inflates in under 3 minutes to factory set firmness. King Coil comes with a rugged grip bottom that holds onto all surfaces and has extra thick sides to resist all kinds of objects. It’s a very high model, giving you 20” of thickness, it’s more like a bed then an air mattress. This is a King Coil, so you are getting the best of mattresses and all the accompaniments that go with it. The Innomax ForeverAire™ Mattress uses the proprietary DuraFlex™ Ripstop Fabric that makes it abrasion resistant and prevents puncturing and lacerating over rough surfaces. There is a Stretch Resistant Laminate coating that prevents Pressure Loss, and there is an Antibacterial and Odor Resistant Enclosure Material which is both Washable and Hypoallergenic. The DuraFlex™ Ripstop Fabric™ Technology actually protects the mattress From Mold & Mildew, and this model comes with a patented Auto Shut off Pump. The Patented Silent Night Comfort Adjust™ Backup Pump maintains air pressure automatically keeping the mattress firm all night and during use. This is automatically controlled with the adjustable firmness control unit. What an exceptional model, unique and fabricated for camping and home use, This is a comprehensive model, is only 8” thick, which is plenty for all camping requirements. The SoundAsleep Dream Series Air Mattress with ComfortCoil Technology is a beautifully constructed model well thought out and engineered. This model comes with 15 gauge material and multi-layered flocked top that combine to create a more comfortable and durable sleeping surface. There is a One-click toggle built-in pump that allows for quick and easy inflation and deflation. This patented is designed to be 20% quieter than the competition, and is fast, with only 4 minutes to full deflation. The bottom of the mattress is coated with a sure grip material that provides exceptional suction even on flat shiny surfaces let alone rough surfaces. 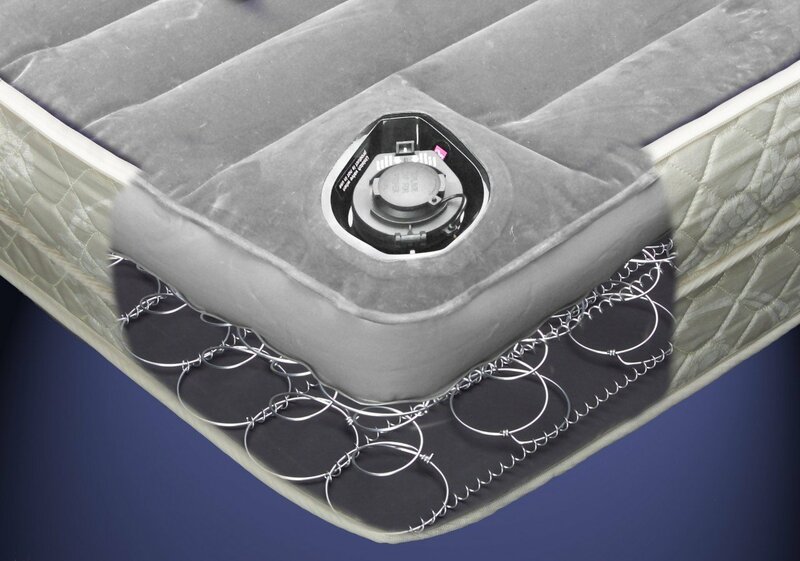 This is a hybrid air and coil mattress, it comes with 40 individual air coils and is covered with a puncture resistant material that supports a combined weight of 500lbs. This is a comprehensive rugged and durable and comfortable camping solution, and is considered to be one of the top rated air mattresses designed for camping. 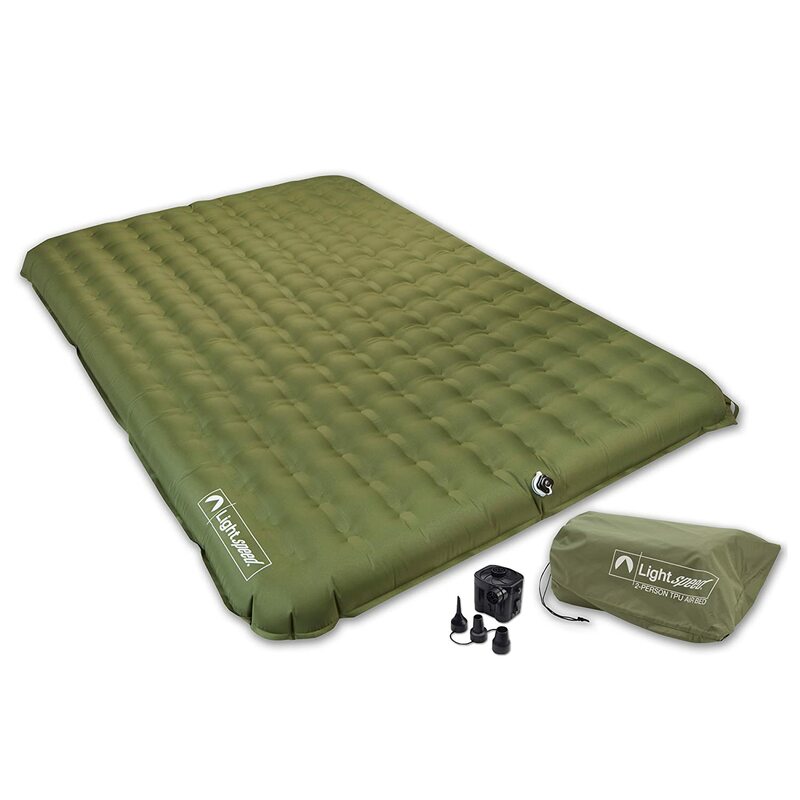 This is a two person air mattress for camping and is made from a very durable and reliable TPU (thermoplastic polyurethane) that is temperature stable and abrasion resistant. It is also 40% lighter than PVC mattresses. This model comes with a two-part Boston Valve which has one large open port for fast inflation and deflation. The valve comes with a second one-way port for topping off and fine-tuning the firmness. The Boston double-valve design is used to make air bed inflation/deflation easy and accurately adjustable. This model weighs in at only 6lbs and is battery operated and strong enough to support the weight of two people. For an excellent queen size solution, without too much thickness, and perfect outdoor resistant qualities, this mattress is the one that is hard to beat. Unlike foam or spring mattresses, an inflatable mattress will not project uneven surfaces, unless you happen to buy a very thin one and place it on a very rock surface, which would most probably end up puncturing it unless you made it out of Kevlar. The airtightness and air valve have to be 100% secured, the seams must be perfectly designed, and the valve should be a stopcock-type valve where the air goes in but cannot come out due to internal pressure. Since a queen size mattress is large, and in most cases, you would want one that is around 4” thick, you would need to consider how to blow it up. This is not a beach ball, and an air compressor or hand bellows would be the best accessory to have to accompany your air mattress. 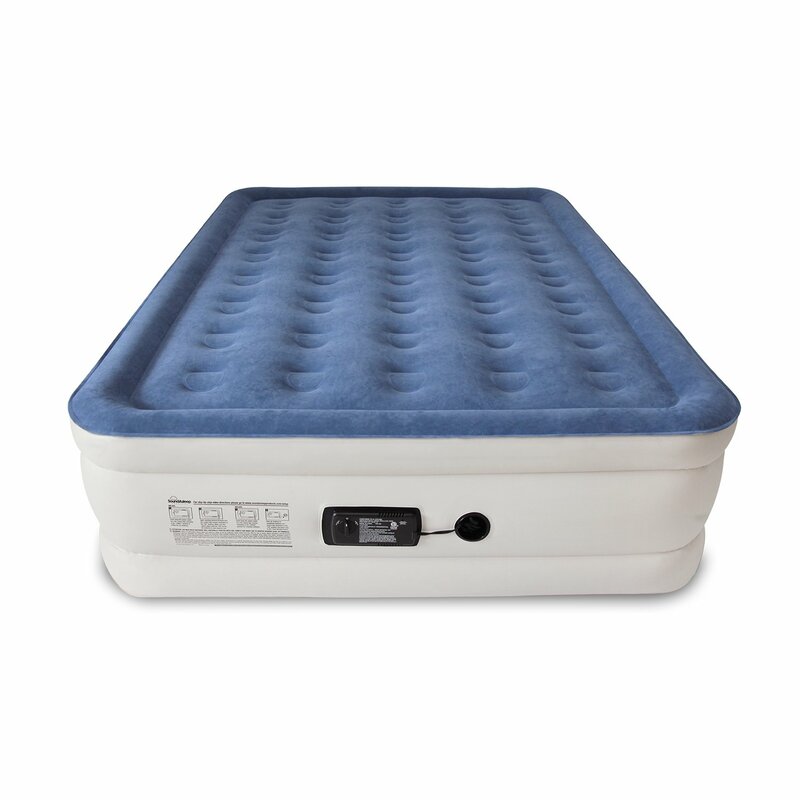 To sum up this section, a camping air mattress must be designed using thick rugged materials that withstand rough surfaces and have a rugged air valve. Its best to buy a thicker model, but one that is foldable to compact storage dimensions. In this article I presented you with five different options to choose from, each one is the best in its category, from extra thick King Coil at 20” to the thin Lightspeed at 7”, each one comes with its own level of comfort and performance, self-inflation devices, and provide the best queen mattress solutions to camping.